This year, World Sight Day (WSD13) falls on 10 October 2013, the second Thursday of October. World Sight Day 2013 is especially important, since it will mark the launch of a new WHO Action Plan on the prevention of avoidable blindness and visual impairment from 2014 to 2019. In keeping with the spirit of this new Action Plan, therefore, the theme for World Sight Day 2013 is: Universal Eye Health, while the call to action to action is: Get your Eyes Tested. This call to action applies to all age groups, since it can help detect diseases such as glaucoma, diabetic retinopathy, cataract and refractive errors, which account for over 75% of cases of avoidable blindness. 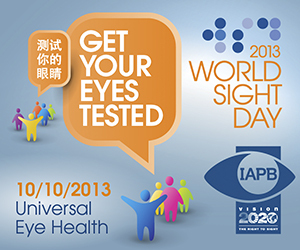 Details and ideas on how to organise your WSD13 activities are available on the official World Sight Day 2013 IAPB website. This entry was posted in Avoidable Blindness, Blindness, Diabetic Retinopathy, IAPB, Journée mondiale de la vue 2013, World Sight Day 2013 and tagged avoidable blindness, cataract, Diabetic Retinopathy, glaucoma, refractive error. Bookmark the permalink.